We are New to the Old Jeep Scene! 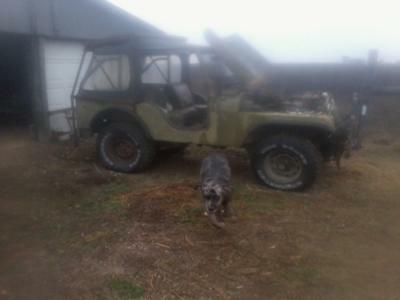 We came across this cool ole Jeep at a really good deal...free sort of! Now we would like to fix it up and put her on the road, the trails and the back pasture! We will kindly accept all ideas hints and helps. The distributor is being changed out to electronic. I have a current issue with the fuel tank under the seat. Like I said....We are newbies but willing to learn with our friends help! So...Hello Friends...We are in San Marcos TX. Larry's Comment: Welcome to the crazy world of Jeeps! Honestly...you will probably either love the experience or hate it...or both. Yes, there is usually no "in between" when it comes to Jeeps. My initial advice is to get your '55 CJ5 running and then evaluate what it may, or may not need. These old Jeeps were initially geared very low (high numerically) to "tractor" over all kinds of rough terrain. To get any top-end speed for road or highway use will require changing the axle gearing, the transmission or adding an overdrive unit (if you can find one). The gas tank under the seat is common, and should pose no problems as long as it is in good condition. The main thing is to enjoy your classic Jeep and have fun with it. Anyone else have constructive advice for Kenn and Robbin? Comments for 1955 Jeep...help ! I too have a '59 Jeep and was looking at swapping out the distributor. Where, what, and what price was the distributor you got? I talked to a local here and have never heard back from him yet. I plan on keeping the manual fuel pump since I hear it is the best thing to do, and just carry a spare for "just in case" purposes. I was also consider trying to put in a heater? Before dumping a lot of money into the Jeep to make it go fast to "baja" in, think of safety. Old Jeeps were not designed to go fast and launch in the air. It's geared for only 45 mph. Do you need any more than that on the pasture? That Jeep is in retirement mode. Take it fishing, slow drives in the country side, and an occasional beer. Nothing wrong with staying healthy, looking good, and wearing good running shoes, but it doesn't mean the old man can now run a marathon. "I don't always go slow, but when I do, I enjoy it! Stay Jeepin' my friends." The Title has a VIN of: 4JB9111 and states it is a 1955.....however we can not find the VIN on the Vehicle itself..?? For starters you should just give it to me! However if that's not an option get to Quadratec's web site and get you their magazine, and get you a manual for that Jeep as well. They are a little pricey but you will find most of your parts there. Also check JC Whitney to compare prices. Some of your parts will be found there. I have an '81 CJ 5 and love it. I recently sold a '71 Jeepster. They are loads of fun . If your going off road I would leave the gears in it. Bigger tires will get you some speed but that low gearing will definitely have to be changed in the axles. As for some parts old Jeeps are everywhere. They never die, never quit, just get parked in a barn till someone decides to love them again! It's all I will ever drive since the first one me and the wife had! Now I have 2 in a series of 4! Our mail lady has one with 385,000 miles on it drives it everyday. 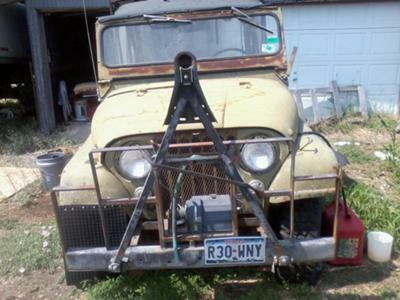 Go to www.thejeepsterman.com you will find anything and every thing for vintage Jeeps. I restored my 1955 CJ5 over the past 10 years. Even have sat. radio. Just wondering, does your '55 say Willys on the tailgate? If you do share the same passion that I have you would understand how different and a unique experience it is going to be while on for an off-road trip with your friends.